I’m officially done with work for the school year and I must admit, I’m pretty stoked about doing my own thing for the next few months. No alarm clock buzzing in my ear at 5:45, no last minute wardrobe changes because I’m a clutz with my morning coffee and certainly no more fitting in baking time between chores and dinner. The summer gives me the opportunity to experience what it would be like to blog full time and I must say, I’m kind of digging it. The first couple of days were spent basking in the fact that there is nothing I have to do. I watched random TV shows – hello, Breaking Pointe on the CW – who knew ballerinas could be so catty?! Watched way too many makeup videos on YouTube and filled a virtual cart at both The Gap and The Limited. However, I got bored pretty quick and decided that I needed cheesecake in my non-working life. You know that I am a sucker for anything mini – especially when the mini-fied creations are served in Weck jars (see the notes section below for details). I created a foundation for this sweet and tart cheesecake by using Newtons Lemon Fruit Thins. Amber recommended them to me and I must admit, I’m kind of addicted. They’re crisp, sweet and just perfect for a cheesecake base. After the cheesecakes were baked and cooled, I topped each one with a layer of homemade lemon curd, fresh whipped cream and ripe raspberries. Light and crisp, just like their cookie base, these mini cheesecakes are the perfect dessert for your next barbecue. Especially because they can be made ahead of time and simply grabbed from the fridge when you’ve had time to let all the hot dogs, hamburgers and guacamole time to settle. Your guests will love the little jars, and you’ll love the minimal effort. If raspberries aren’t your thing, you can top them with any berry that strikes your fancy – strawberries or blackberries would also be a nice addition. 2. Place the Newtons Lemon Fruit Thins into the bowl of a food processor, attach the lid and pulse the machine until you have fine cookie crumbs. 3. In a medium bowl, stir together cookie crumbs and melted butter. Evenly divide the crumbs between your individual serving, oven-safe dishes and lightly press the crumbs into the bottoms of each dish to form a crust layer. Place the prepared cheesecake crusts on a baking sheet and bake the crusts in preheated oven for 6 minutes, carefully remove them to a wire rack to cool. 4. Begin to boil a large pot of water for the water bath. 5. In the bowl of your stand mixer fitted with your paddle attachment, combine the sugar and lemon zest and mix until the sugar is moistened and fragrant. Add in the cream cheese and cream together until smooth. Add eggs, one at a time, fully incorporating each before adding the next. Make sure to scrape down the bowl in between each egg. Add heavy cream and vanilla and mix until smooth. 6. Pour batter into serving dishes , directly onto the prebaked crusts, until about 3/4 of the way full. Place jars into a larger pan with high sides and pour boiling water into the larger pan until halfway up the sides of the jars. 7. Bake 25 to 30 minutes, the edges will appear to be set, but the center will still have a little jiggle to it. 8. Carefully remove the cheesecake jars from the water bath and place on a cooling rack to cool completely. Once the cheesecakes are completely cooled, place them into the refrigerator for at least 5 hours. 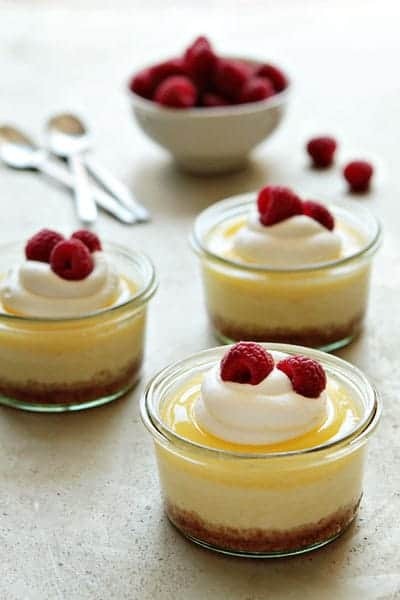 Before serving, top each cheesecake with lemon curd, fresh whipped cream and berries. - If you cannot find the Newtons Lemon Fruit Thins (I purchased them from Walmart), you can substitute them with about 3/4 cup graham cracker crumbs. - The Jars seen in the photos are Weck Mini Mold Jars 976 - 165. Their volume is 5.6 fl oz. 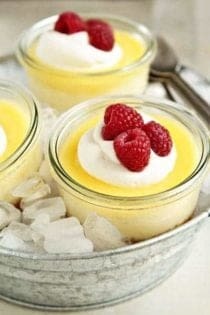 - If you do not have jars, you can use oven-safe ramekins. Great idea! Are you able to tell me if I can make these in advance? And if the crust gets soggy? I need to make 30-36 of these for a party! Thanks! i want to make this for a party…so i am ready to buy the wreck jars…quick question..why did you choose the 976 size vs the 080? i haven’t seen these in person but is 080 too small for cheesecake? i am considering buying the smaller ones…. Hands down! Thanks so much for following MBA and have a wonderful day! I am totally in love with your photos (and well the recipes too). I am slowly working on my food photography but routinely come to your page to check out styling, positioning, etc. Well done on a wonderful blog that has gorgeous photos and recipes that match! You totally just made my day! Thanks so much for your kind words and for reading My Baking Addiction. Have a great weekend. I just made this yesterday and I loved them. That homemade lemon curd is just delicious!!! and so ease to make!!! That’s great! Thank you so much for stopping back to let us know that you enjoyed the recipe. Have a great day! Two years ago I married (at 60) my sweetheart of 13 years. We had a picnic in our friends’ backyard: pulled pork, fried chicken, cole slaw. His favorite dessert is Lemon Bars. I made them in small Mason Jars. They were the take-home favor for each of our guests. Recently I had a luncheon for people. I did Peach Cobbler (the recipe that pours the batter on the bottom first and it bubbles up to the top as it bakes) They were a huge hit! Everyone had one at lunch and one to take home. Perfect portion control! Laurie, I think that might be okay in the cheesecake layer, but you’d still need regular sugar in the lemon curd. It won’t set up correctly without sugar. Love the sound of this! Do you need special baking jars, or could I use Ball jars that are used for water bath canning? Canning jars will work just fine. Thanks for stopping by. I wonder if I can use regular mason jars??? Regular mason jars will work just fine! Have a great day and thanks so much for stopping by. Do you think this would work in a mason jar – I mean the kind people use to can jelly in? I know they are always inserting in a boiling water bath – I wonder if they could tolerate the heat of an oven? This does look amazing – I’d love to try it! Beautiful photos! Hi, Julie! I think mason jars can be put in the oven in a water bath. I’m a little hesitant, though! Let me know if you try it! Hi, Shradha! This recipe is approximately a half recipe for a 9 inch cheesecake. I’ve never tried this recipe using a full cake pan, so I can’t attest to the outcome. Maybe double the recipe and use a 9 inch springform pan? I also have another recipe for a Lemon Cheesecake with Fresh Berries that I think you’d love that is a whole cheesecake. Let me know how it goes! Great recipe, Will surely try out this weekend. Currently busy in outside activities. Can you list the calorie/carb and so forth info , please :) …..
Hi, Kay! This nutrition calculator should help. I hope you enjoy the cheesecake! You didn’t specify how many Mason jars to use. Hi Carolyn – This recipe yields 6 cheesecakes, so you’ll need 6 jars. Happy Baking!